For those who know Fasano – Brazil’s leading luxury hospitality brand – it makes perfect sense that they would open a resort in Angra dos Reis. The archipelago of 365 lush islands has been the playground for the country’s rich and famous for decades – more or less the same group that wines and dines in the Fasano hotels and restaurants in nearby São Paulo and Rio de Janeiro. 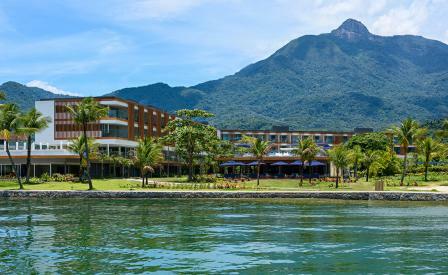 Called Angra for short, this tropical paradise had been difficult to experience for visitors not connected to the area’s notable yachting scene, but this new development has changed all that. In typical Fasano fashion, the property was designed as an elegant Brazilian modern enclave, with clean lines and right angles, articulated in rich, warm woods and natural stone by duo Bernardes + Jacobsen (who now operate independently). Wedged between the mountains and the sea, the property feels intimate, even with 60 hotel suites, 145 residences and a long list of amenities that includes, of course, a sizeable marina. And a new Fasano hotel wouldn’t be complete without a stunning new restaurant concept. Building on the family’s 100+ years of gastronomic excellence Crudo specialises in sophisticated seafood dishes. Better yet, they will even pack an elegant picnic lunch for your private boat charter out to the islands.